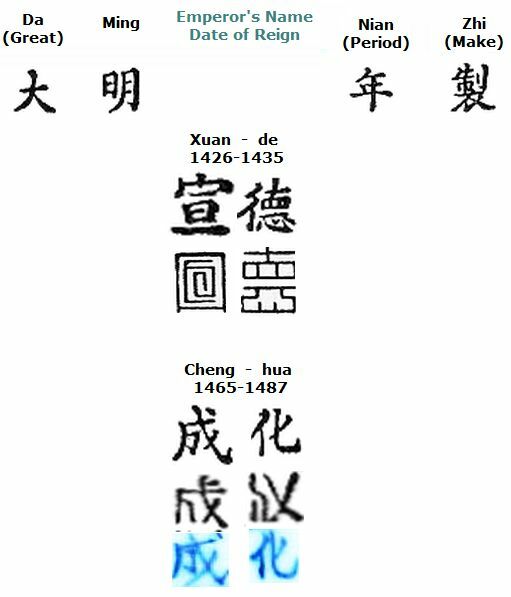 This is the pottery identification marks - China Chat archive - Oriental/Far East section. We look to investigate some of the mysteries of the East. 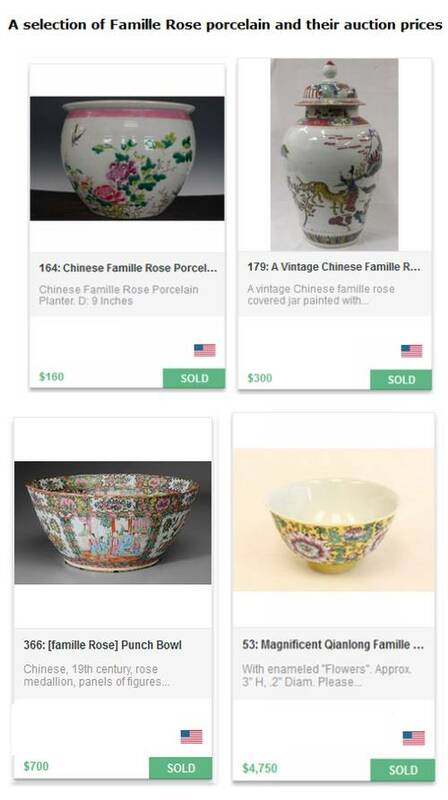 We have ongoing discussions going on about such diverse subjects as the red Qianlong Qing red seal marks of China, Japanese tea sets with the ladies head hidden in the base of the cups, Famille Rose porcelains from China and Japanese dragon tea ware, and lots more. If you'd rather get hands-on help with your identification & valuation needs, I can do so right now! 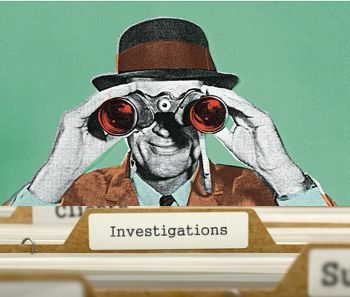 If you need a bit of personal help in your investigations, I'm here to help! Back to the research . . .
Let's first take a look at the red seal marks you might run across. 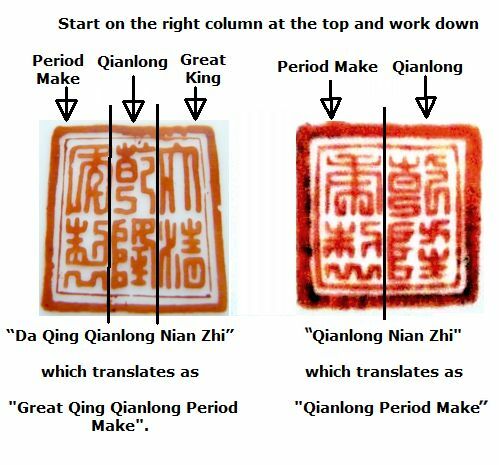 One of the most common is the red Qianlong seal marks. 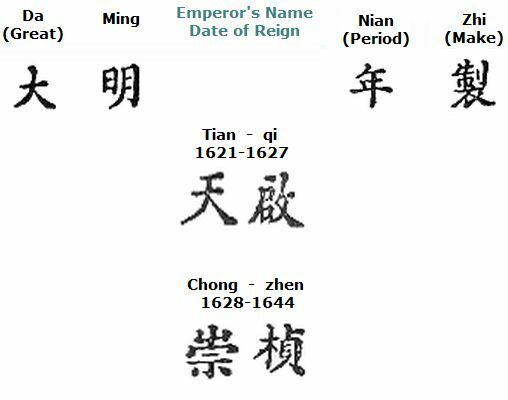 Qianlong was an Emperor hundreds of years ago (1736-1795) during the Qing Dynasty (1644 to 1912). 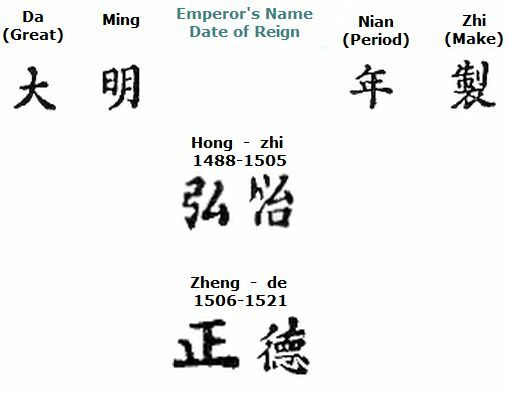 The pottery identification marks below are 20th century (not Qianlong, despite what they say). 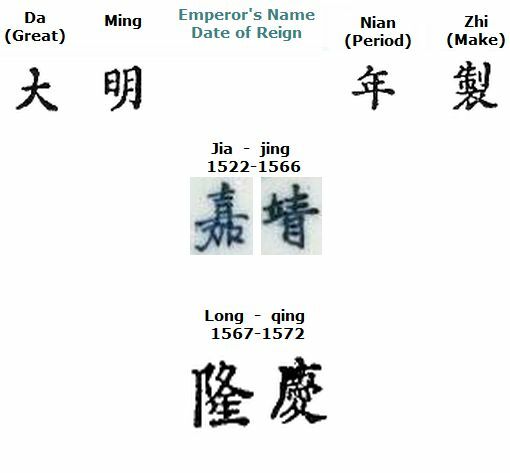 So these two red seal marks say the same thing apart from the one on the left has the additional 3rd column on the right saying "Great Qing" - which is a reference to the lengthy Qing Dynasty (1644 to 1912) within which the Emperor Qianlong reigned from 1736-1795. “Da Qing Qianlong Nian Zhi” translates as "Great Qing Qianlong Period Make". Many of these marks are on 20th century export replicas, and not the real thing. The majority of Chinese wares we see in the West are export items with 'apocryphal marks' (i.e. not of the era stated). 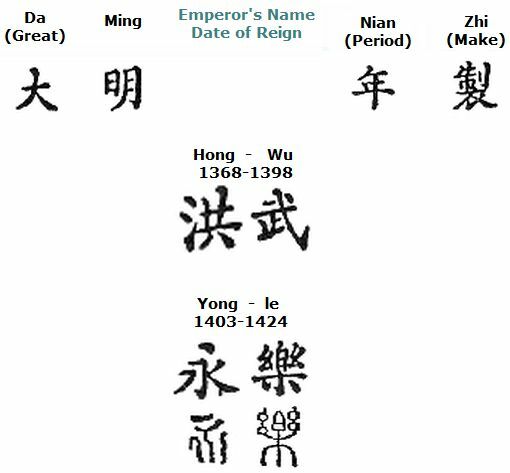 There are only two significant dynasties for us ordinary folk to worry about, Ming and Qing - together covering 500 years up to the first part of the 20th century. The majority of wares we have in our homes are apocryphally marked as Qing (according to my records with my site visitors over the past 10 years). 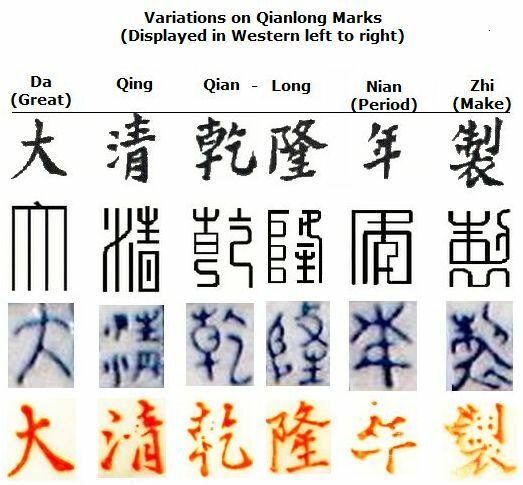 Some variations of the Qianlong marks as shown on the following chart below. The following marks shown on the chart could equally be real or apocryphal (not of the era stated). In Chinese, the same words can be written very differently. So in order to interpret what a mark says, we need to know which of the seemingly different characters are, in fact, saying the same thing. Compare the marks on the chart to see. It is important to understand that an apocryphally marked item (made later than the era stated), does not render the item either a 'fake' or valueless. In essence, they are items made in homage to the great era of Chinese porcelain making. These items may still have significant value, depending on the quality of the decoration and make. The above Qianlong replica marks are the ones you are most likely to see on Oriental looking vases and other Chinese porcelains. The most common type of vase we have seen on our posts is the typical Chinese Famille Rose decoration. Famille Rose means 'the family of reds', refering to the enamel paints. A new red palette was developed in the Yongzheng era and became very popular for export in the Qianlong period. The red/rose enamel palette was developed after much technical development and people in the West seemed to really like it, especially when the decoration was complimentary to the ornate European style fashionable at the time (Rococo). Famille Rose enamels are mixed with white and so are opaque (not see through). The green tinted style (Familler Vert) has a transluscent see-through effect and pays homage to the paintings of the Kangxi period. Here are some examples of what you might see out there. Notice the variation in prices. 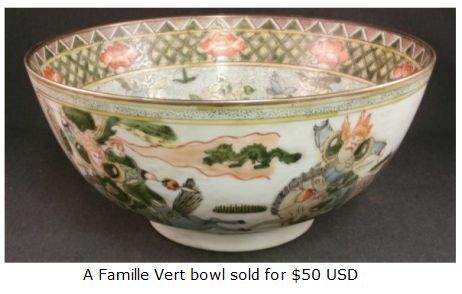 Occasionally people have sent into our expert valuation service, some real Imperial Court china, and very valuable it is. You Can Read Chinese Marks! 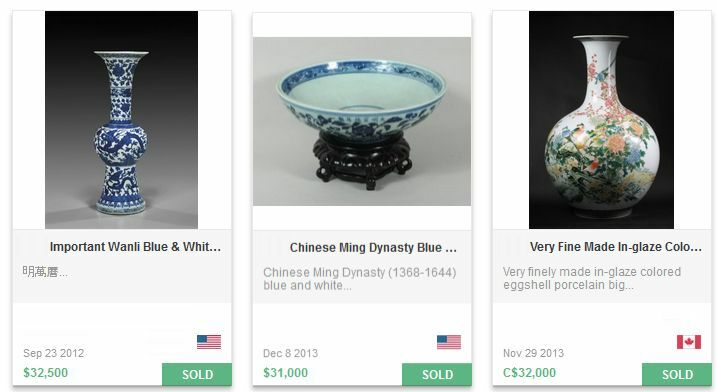 Perhaps the most alluring of all porcelain is the exquisite and very old masterpieces from the Ming Dynasty (1368-1644). 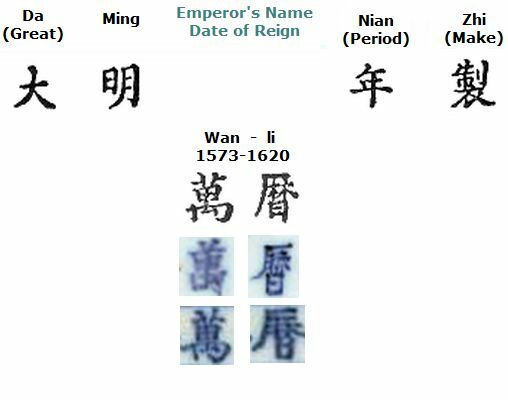 Using the same formula as shown above for phoney 20th century Qianlong marks, we can all become instant armchair experts on how to read Ming marks. So now we had a quick glimpse at what the other half have in their living rooms, we can move on. In our Far East China Chat posts we investigate the Japanese pottery identification marks of the 1950's and 60's and identify marks in this difficult area. Hardly ever are marks setting out to identify the factory in which they were made. We discuss Arita, Imari, Kutani, Satsuma and what those words mean. We look at the the type of dishonest marks Chinese and Japanese makers have been using, and are still using. Above all the China Chat discussions are about helping us become much more aware of what are likely to have in our homes and stumble across in Garage sales. Feel free to browse or search these interesting China Chat discussions where visitors from all over the world help each other solve mysterious backstamps. This is a free to access public record which has been being built since 2007. It has helped countless thousands of people know what ceramic items they have on their tables and in their cabinets. Below are the China Chat archives for Far East marks. Thinking Japanese Pottery Mark Maybe? 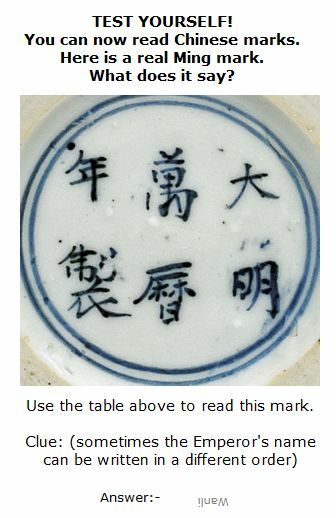 Japanese Porcelain Mark - Can Anyone Translate This Please? Red Stamped Seal Pottery mark Chinese or Japanese ? Is This An Japanese Artist Mark? N with a C overtop:- This is a figurine with a N with a C on top. This is followed underneath by a number. Can you identify this mark? W.L Pottery Mark - fits the criteria for original..is it? W.L. Pottery Mark - William Lowe ("Court China") or Wong Lee?